The UK and Ireland have seen their share of medieval kingdoms, ancient legends, and folk heroes. From King Arthur to Robin Hood, from William Wallace to Brian Boru – the historical events and characters of these misty isles have inspired countless fantasy worlds, from Lord of the Rings to Game of Thrones. Here are some of the best historical sites for history nerds looking to let their imaginations run wild – as well as a bit of fantasy folklore for good measure. Surely you knew this was coming. Throughout history, control of the Tower of London often meant control of the country. The tower is where the young princes Edward and Richard mysteriously disappeared in 1483, allowing Richard III to take the throne for himself. The tower is where Richard the Lionheart dug a defensive moat, shoring up the city’s defenses for years to come. It’s where the Royal Mint was located, controlling the fate of England’s economy, and where William the Conqueror created the first stone keep in the nation, following his successful conquest. Having survived countless sieges, including an almost-fatal encounter for Richard II, who took shelter in the tower as the Peasants’ Revolt closed in around him, the Tower of London is now an iconic part of British history. When you wander its halls, remember that this is where Guy Fawkes and his co-conspirators, along with countless other prisoners, were brutally tortured. It’s where prisoners like Sir Walter Raleigh, Lady Jane Grey, and even a young Queen Elizabeth I awaited their fate, unsure if they would be executed or rescued at the last minute. It’s where the course of history was decided – where royals lived, feasted, or were imprisoned. England wouldn’t be the same without the events that took place within this iconic building. While not trying to turn this into a “best of London” list, we simply had to include Westminster Abbey. We promise the next one will be more unexpected! Originally designed as a suitable burial ground for Edward the Confessor in 1042, Westminster Abbey now serves as the resting place for some of Britain’s most famous politicians, royals, heroes, thinkers, and artists. Geoffrey Chaucer, one of the fathers of English literature, is buried here – having lived and written in the abbey during his lifetime. Other literary giants who rest here include Dr Samuel Johnson, the creator of the English dictionary, Alfred Tennyson, and Charles Dickens. Scientists including Charles Darwin, Stephen Hawking, and Isaac Newton are also interred within the abbey’s grounds, as well as the majority of kings and queens from English history since the Middle Ages. The King James version of the bible was compiled here in the 1600s, altering the course of Christianity for centuries to come. In more recent history, it served as the site for one of the most notable public funerals of the twentieth century: the funeral service of Princess Diana of Wales. Just over a decade later, her son, Prince William, would marry Catherine Middleton here. Westminster Abbey is a must-see for anyone visiting London, and for good reason. It’s the closest you will get to some of the most influential figures not just in British history, but in the history of the world. Told you the next one would be unexpected. Not many people will know as much about Bunratty Castle as they do about Westminster Abbey or the Tower of London, but that’s not to say its story isn’t just as interesting. The site of the castle itself dates back just far enough to blur the line between mythology and history. It’s believed to have been mentioned in the Annals of the Four Masters (Annála na gCeithre Máistrí) as a settlement established by Norse raiders as far back as 977, which was destroyed by the legendary Irish king Brian Boru. Bunratty Castle itself served as a defensive fortification for centuries, and was besieged multiple times with varying degrees of success. However, what’s unique about the castle these days is the ability for visitors to truly travel back in time by visiting it. The popular Bunratty Folk Park is carefully crafted to give an accurate impression of a 19th-century Irish village, with authentic buildings and ‘residents’ going about their daily 19th-century activities. Adult history buffs will appreciate the historical accuracy, while kids who are potentially less interested in authentic Victorian re-enactments can explore the delightful fairy village. Want to go back in time even further? Prepare yourself for a genuine Middle Ages banquet, featuring a fiendish medieval mystery! Good things come in pairs, as they say. The White Cliffs of Dover are known worldwide, partially due to their iconic role in the climax of Shakespeare’s famous King Lear. These are the very same cliffs from which the Earl of Gloucester wished to throw himself into the sea out of despair. The area also features an 11th-century castle, likely built on the site of an old Roman outpost. Dover Castle is perhaps the most strategically important fortress in English history, as it faces towards mainland Europe – where most of the military threats facing the nation have historically come from. The Cliffs of Dover let you trace back the steps of Roman conquerors expanding their reach across the continent; kings fallen from grace, and battle-hardened warriors defending – or attacking – the British shore. Not old enough? The iconic white chalk cliffs were caused by millions of years of geological transmutation. Parts of the famous rock formation feature fossils from creatures older than human civilisation itself. How’s that for old? Only a trebuchet’s throw away from Dover is one of the most historically significant religious buildings in the UK: Canterbury Cathedral. It goes back all the way to the year 597, when Pope Gregory the Great (not sure how influential he was? the clue is in the name) sent a mission to convert the local Anglo-Saxon population. Over the centuries, this was largely successful, until a certain problem arose: Danish raiders, who weren’t big fans of the local clergy, arrived in scores, and well, raiders gonna raid. In 1011, the Cathedral’s Archbishop was taken hostage and executed by the raiders (who we won’t refer to as Vikings for historical accuracy) – becoming the first of five martyrs in the cathedral’s long history. The cathedral is also known as one of the key destinations for spiritual pilgrimages in England, perhaps best exemplified in Chaucer’s Canterbury Tales – a tale of Middle-Ages fiction detailing people from all walks of life coming together on a pilgrimage to the cathedral. A key moment in the cathedral’s history, and likely what caused the amplification of the site as a holy pilgrimage destination, was the assassination of Thomas Becket, the Archbishop of Canterbury, in 1170. It’s fair to say that Becket did not get on very well with King Henry II, who made the mistake of uttering his displeasure out loud. What the king said exactly remains a matter of dispute – but most commonly it is transcribed as something along the lines of “Will no one rid me of this troublesome priest?” A group of four knights is said to have taken this quite literally, and traveled from Normandy to Canterbury before slaying Becket. Another fortification established by the victorious William the Conqueror, Warwick Castle dates back to 1068. Its strategic position had been long-recognized by that stage, as an Anglo-Saxon burh (defensive fort) was established here over 150 years earlier by Ethelfleda, the daughter of Alfred the Great. This was one of ten similar fortifications which defended the kingdom of Mercia from invading Danes – something that will sound familiar to fans of Bernard Cornwell or The Last Kingdom. The castle has some of poignant and fascinating stories, as you might expect from a military and cultural building with almost a millennium’s worth of tales to tell. In 1153 the castle belonged to the 2nd Earl of Warwick, Roger de Beaumont, who was fighting against the invading army of Henry of Anjou. According to a contemporary 12th-century historical text, the invading army deceived the Earl’s wife into believing that her husband had been killed in battle, leading her to surrender control of the castle out of grief. While still alive and attempting to stave off the invasion, the Earl is said to have died upon learning this news. Warwick Castle also played a role in the Wars of the Roses, in which two noble English houses vied for the throne. King Edward IV was briefly imprisoned in the castle, when the Earl of Warwick attempted to usurp his place, and the castle passed between dynasties before eventually coming under the control of the Crown. Once again, Richard III was involved, creating two gun towers as an attempt to shore up the castle’s defences. The Battle of Bannockburn in 1314 was a landmark event in Scottish history, representing a great victory for Scottish independence over their English overlords. 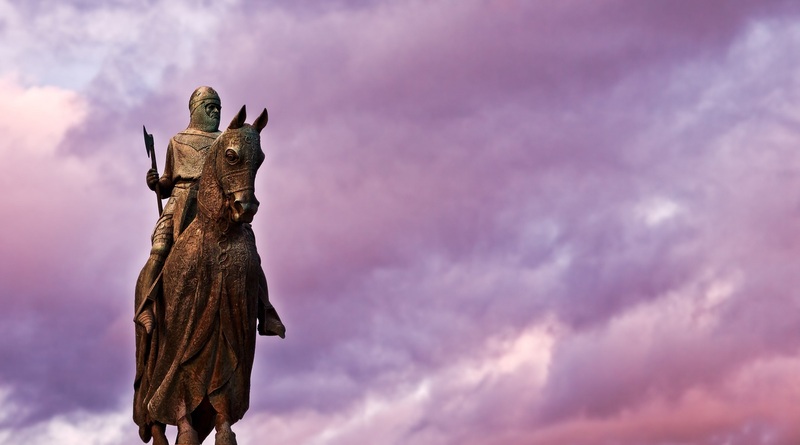 Robert the Bruce, King of Scots, was one of the most famous warriors of his generation – and remains one of the most famous freedom fighters in history. At Bannockburn, the Scottish army was outnumbered. King Edward II of England led a force of up to 25,000 troops against a resisting army generally considered to consist of anywhere between 5,000 and 10,000 men. While it was by far the largest ever English army to ever invade Scotland, it wasn’t enough. The Scots formed strong defensive lines, guarded by long pikes, and the battle raged for two days. Robert the Bruce himself was in the thick of the battle, engaging in recorded single combat with an English knight, Henry de Bohun. These days, military history fanatics can get a first-hand experience of the Battle of Bannockburn, with an immersive 3D look into the historic conflict. Visitors can see medieval knights and soldiers from both sides, as well as ancient weapons and armor. Weekend events also include activities like weapon-handling and archery lessons, for a full taste of medieval military life. We can’t tell you interesting historical stories about the events that took place at Stonehenge. We don’t know which kings visited, which battles were fought, or even what this spectacular and bizarre configuration of rocks meant to people since their original placement as early as 3000 BC. And that’s exactly why this is one of the sites that has generated the most myths and legends in the world over the course of centuries of civilization. One legend involves the Devil himself purchasing stones from a woman in Ireland (at least he bought them instead of stealing them) and placing them down while boasting that no one would ever know how these rocks arrived. Presumably said while cackling maniacally. However, the reason why the Stonehenge myth prevails is their presence in the greatest British story ever told: the Arthurian legends. The medieval historian (and, let’s face it, author of fiction) Geoffrey of Monmouth recorded a tale in the 12th century, in which he attributed the construction of Stonehenge to Merlin. He claims that the famous rocks used were healing rocks, originally carried over by giants. Interestingly, he also believed that these rocks were taken via Ireland. Though this time they weren’t purchased by the Devil – they were taken by military force, and through Merlin’s magical cunning. Monmouth states that the father of King Arthur, Uther Pendragon, was buried in the middle of the famous monument. We’ll be honest. The stones probably weren’t carried by giants. Merlin, if he existed, probably wasn’t a warlock as much as a very clever engineer. The Devil may not have cackled maniacally as he bamboozled the world by placing large rocks all over the place. But there’s no denying that Stonehenge has a unique aura of historical mystery, and is one of the most perpetually fascinating sites in the world – and that’s enough to place it at the end of this list. Was that enough to whet your historical appetite? See what other historical sites the UK and Ireland have to offer!